Please join us on Sunday, December 3, 2017 at Bartlett Pond Park for our fifth annual Pearl Harbor Day Patriotic Holiday Tree Lighting. Start time is 12:30pm. 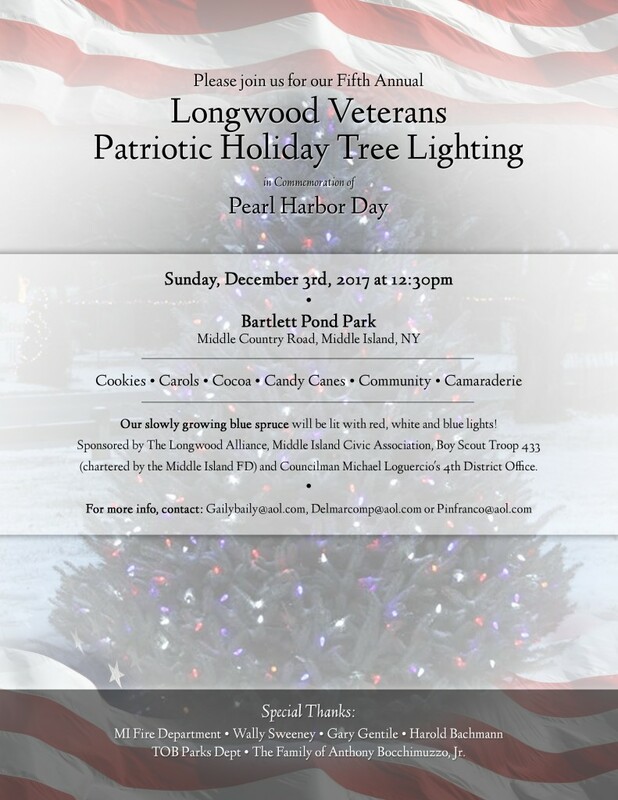 We will recount the Day of Infamy and how the story of one man’s survival inspired the Longwood Veterans Project. Holiday wreaths will be placed at each of our eight granite monuments by our MIFD volunteers. Our blue spruce will be decorated in a patriotic theme and we will turn on the red, white and blue lights. Carols, candy canes, cocoa, cookies and camaraderie will be shared. Weather permitting, we will be trimming the tree on Monday, Nov 27 at 11am. Stop by if you’re free and join me in giving Frank Bailey and Harold Bachmann plenty of unsolicited advice!